New shortwave stations rarely go unnoticed by DXers constantly scanning the bands, but Radio UNAMSIL remained an elusive target for about one and a half years after it was launched. Finally in April 2002 the station was picked up on 6137.8 kHz, off the nominal frequency of 6140 kHz. The first known logging by DXers outside Africa was made by Ralph Brandi in the United States, and since then the station has been heard several times in the Western hemisphere and in Europe. Radio UNAMSIL - which stands for the United Nations Mission in Sierra Leone - was established in May 2000. Station manager Sheila Dallas set up the station in a hurry; FM equipment arrived in Sierra Leone on May 18 and the station was already on the air on the 22nd of May 2000. Shortwave broadcasts began later that year, presumably in early November. Initially the station broadcast 12 hours a day but began a 24-hour operation within a couple of months. It had - and still has - a very important and ambitious task; to help restore peace to one of the most troubled nations on earth by offering an alternative to the incitement of hate heard on militia radio stations. The small West African nation of Sierra Leone has gone through an extremely brutal civil war, which started in 1991. Despite a peace agreement signed in 1999 between the government and the Revolutionary United Front (RUF) rebel movement, fighting flared again in May 2000 when RUF took 500 UN peacekeepers hostage. RUF has no clear political agenda, but is notorious for forcing children to fight in its ranks and for its brutal treatment of the civilian population in rebel-controlled areas. Nowadays sporadic fighting still rages in parts of the country. Sierra Leone is rich in diamonds and other minerals, but smuggled diamonds have only fueled the war, and its people are among the poorest in the world. At roughly 40 years, life expectancy in Sierra Leone is the lowest in the world. It is estimated that over 2 million people, out of a total population of 5.5 million, are displaced by the war and living as refugees within Sierra Leone or in neighboring countries. 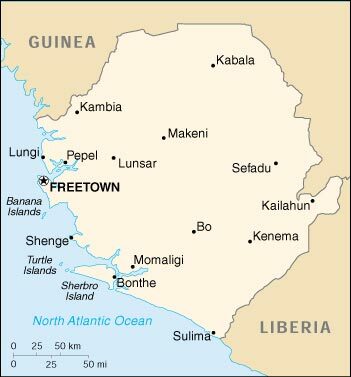 Not even refugee camps across the border are safe; most recently on June 20th a rebel group in neighboring Liberia, called Liberians United for Reconciliation and Democracy (LURD), attacked a refugee camp in Liberia sending its 20,000 refugees - mostly from Sierra Leone - fleeing once again. Relative peace prevails around the capital Freetown, thanks to the presence of the United Nations peacekeepers. The UNAMSIL force now numbers about 17,500 with a mandate ending in September 2002. After that the force is unlikely to be scrapped but will probably be scaled down, although the situation shows only faint signs of improvement. As an important step towards normalcy, free and fair general elections were held on May 14th 2002 resulting in a massive voter turnout of about 90 % of the electorate. Ahmad Tejan Kabbah - a former UN diplomat - was overwhelmingly re-elected as president. The elections confirmed the popular rejection of the rebel agenda of rapacious nihilism. The RUF's political wing scored less than 2 % of the presidential vote, and failed to win any seats in the parliament. Still, governing the country is an uphill battle for Kabbah, who has few resources to satisfy rising demands. Under these circumstances, Radio UNAMSIL played a vital role during the election campaign. Broadcasting around the clock with a staff of about a dozen people, Radio UNAMSIL aimed to educate the voters about the upcoming elections, giving a forum for the public to voice their opinions on phone-in shows aired through the night. A new program called Election Watch was broadcast Mondays through Fridays from 7:30 to 10:30 a.m. to cover electoral activities around the country, supply public education on the issues and provide all political parties with an equal chance to air their platforms. Another program called Time with the Candidates offered each presidential candidate a chance to be interviewed for one hour to get the campaign message across. This program aired at 19:30 local time starting April 29th. The station with its two production studios is located at the Mammy Yoko Hotel in the West End of Freetown along Aberdeen Beach. Aside from 6137.8 kHz shortwave, Radio UNAMSIL broadcasts on FM 103. This frequency originally belonged to We Believe in God (WBIG), owned by Hilton Fyle, but was later transferred to UNAMSIL. On the FM band, Radio UNAMSIL's signal covers the capital area, but the shortwave transmitter should be heard all over the country. Interestingly, the same FM transmitter was previously used by another UN operation, Radio Minurca in the Central African Republic, and was originally donated to the UN by the government of Denmark. Radio UNAMSIL is funded by the United Nations and is actually part of the Public Information Section of the UNAMSIL operation. Its broadcasts include music, local news, entertainment and all matters related to United Nations activities in Sierra Leone, with the overall aim of promoting peace in the country. Radio UNAMSIL's staff is a combination of international broadcast professionals and a few Sierra Leonean broadcast journalists. Most of Radio UNAMSIL's programming is produced live, with the exception of the station's official statements. All broadcasts are aired in English except for greetings in the different languages of countries that have contributed soldiers to the peacekeeping forces. Underlining all programming is an emphasis to work in close co-operation with the community and involving the listeners in its programming. Outside the target area Radio UNAMSIL can be best heard during the night, when most interfering stations are off the air. Due to its low power of only 1 kilowatt, the station is quite a difficult catch. Reception reports can be addressed to the UNAMSIL office in Freetown, where Public Information Officer Patrick Coker verified my report by email. At the time of writing, this was presumably the first QSL reported from the station.